KIHEI — It was Girls Day for the Maui Interscholastic League at the K. Mark Takai State Swimming and Diving Championships on Saturday at the Kihei Aquatic Center. Five different MIL girls won individual state titles in the eight-event individual race slate. Adding in Baldwin High School’s title in the 200-yard medley relay, the MIL claimed gold medals in six out of 11 total girls events. The Baldwin girls finished second in the team standings with 40 points, 26 behind Punahou. No MIL boys teams scored in the meet. The Punahou boys scored 67 points, 30 more than Mid-Pacific. The day started with a group Maui cheer amongst the MIL girls and the parade of gold ended with an emotional win for Baldwin senior Rebecca Buenrostro-Gallimore in the 100 backstroke, an event she qualified for in fourth place. 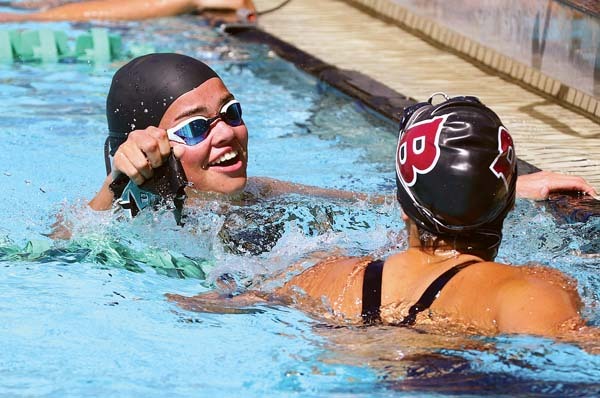 It was the last competitive swim for Buenrostro-Gallimore, the reigning MIL Water Polo Player of the Year who plans to pursue that sport in college. The unexpected win came after a second-place finish in the 50 free, behind Eyre. Seabury Hall junior Jasmine O’Brien defended her state title in the 500 freestyle, rebounding from a fourth-place finish in the 200 free. 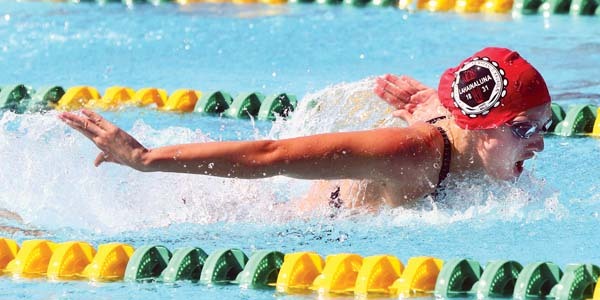 Lahainaluna sophomore Lexi Anderson won the 100 butterfly, and later finished fifth in the 100 back. Anderson’s time of 54.85 in the butterfly was a personal record by more than a second. Anderson smiled when asked about her Valley Isle peers. Eyre’s time of 23.69 in the 50 was a personal record by 0.3 seconds. 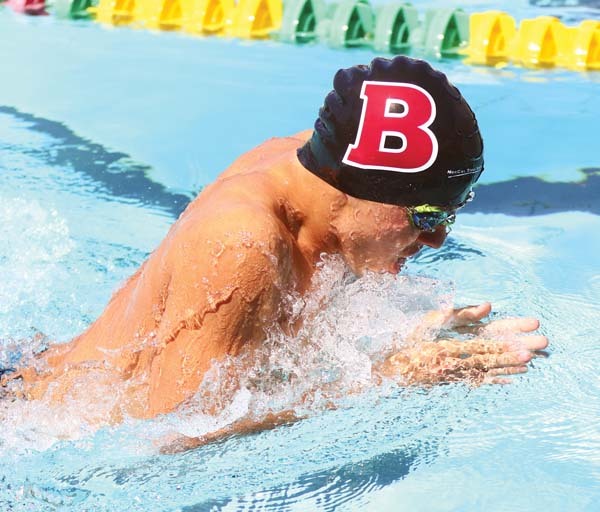 Baldwin junior Kaimilani Matsumoto won the 200 individual medley and then took second in the 100 breaststroke after entering with the seventh-fastest qualifying time — the breaststroke breakthrough came moments after Buenrostro-Gallimore’s victory in the 100 back. Buenrostro-Gallimore and Matsumoto teamed with senior Bailey Augustine and freshman Kylie Carter to win the 200 medley relay. That same foursome finished second in the 200 free relay. 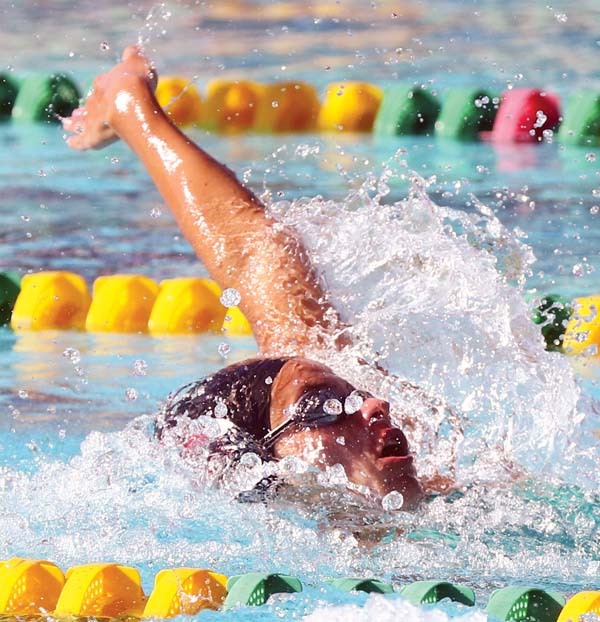 Maui Prep’s Kysha Altura, a two-time state champion last season who is headed to Fordham University on a full-ride swimming scholarship, finished second in the 200 free and 100 butterfly, behind Anderson. MIL girls went 1-2 in the 50 free and 100 fly, and 1-4-5 in the 100 back, with Maui High freshman Jordynn Brown in fourth. Brown was also sixth in the 100 free. 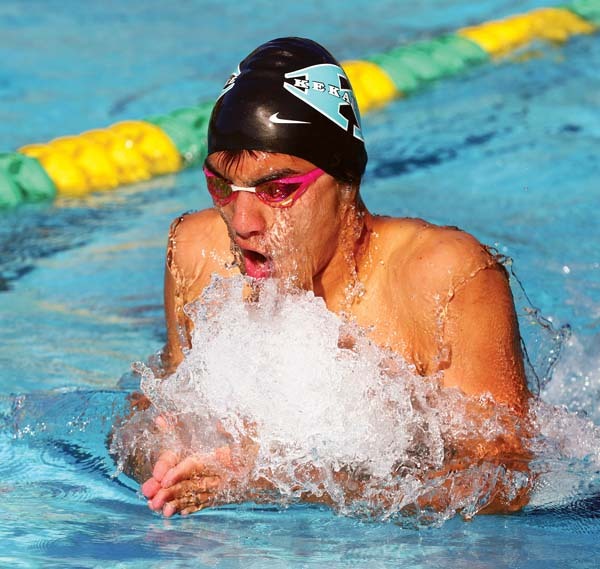 The only MIL boy to make an individual final, King Kekaulike junior Austin DeCambra, finished eighth in the 100 breaststroke. Other point scorers (top five) from the MIL included Seabury Hall senior Skylar Lickle, who was third in 1-meter diving, and the Spartans’ foursome of Madison Eiting, Kamille Pellettireri, Paige Nagahama and O’Brien, who took fifth in the 400 free relay. Team standings–1. Punahou 66, 2. Baldwin 40, 3. Kamehameha Kapalama 28, 4. Hawaii Prep 22, 5. Kaiser 15, 6. Seabury Hall 13, 6. Kalani 13, 8. King Kekaulike 10, 9. Maui Prep 8, 10. Lahainaluna 7, 11. Le Jardin 6, 12. Waiakea 4, 13. Maui High 2, 13. Leilehua 2, 13. Moanalua 2, 16. Maryknoll 1, 16. Iolani 1. 1-meter diving–1. Emma Ng Pack, Punahou, 363.80; 2. Elena Yuen, Punahou, 361.75; 3. Skylar Lickle, Seabury Hall, 356.55; 4. Jill Chaffee, Kaiser, 346.15; 5. 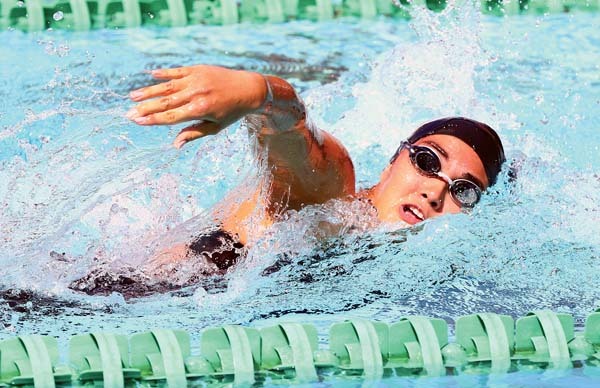 Lauren Takanishi, Iolani, 329.25; 6. Channe Asuncion, Kaiser, 310.65; 7. Nicole Nagata, Iolani, 309.85; 8. Mahana Merrill, Baldwin, 305.70. 200-yard medley relay–1. Baldwin (Rebecca Buenrostro-Gallimore, Kaimilani Matsumoto, Bailey Augustine, Kylie Carter) 1:48.22, 2. Punahou 1:48.76, 3. Kamehameha Kapalama 1:50.81, 4. Kaiser 1:50.92, 5. Kalani 1:51.52, 6. Maui Prep 1:53.23, 7. Seabury Hall 1:54.45. 200 freestyle–1. Sydnee Whitty, Punahou, 1:50.69; 2. Kysha Altura, Maui Prep, 1:50.96; 3. Shaye Story, Kamehameha Kapalama, 1:54.03; 4. Jasmine O’Brien, Seabury Hall, 1:54.19; 5. Mina Poppas, Waiakea, 1:54.38; 6. Mari Yasumi, Kaiser, 1:56.17; 7. Chanel Ng, Punahou, 1:57.91; 8. Reyna Iwamoto, Moanalua, 2:00.17. 200 IM–1. Kaimilani Matsumoto, Baldwin, 2:04.87; 2. Maile Lawson, Hawaii Prep, 2:05.46; 3. Nohea Lileikis, Punahou, 2:07.36; 4. Jamy Lum, Kamehameha Kapalama, 2:08.20; 5. Shirley Li, Kalani, 2:09.06; 6. Paloma Banto, Maui Prep, 2:09.94; 7. Korrie Tengan, Waiakea, 2:13.46; 8. Kyrie Sasaki, Punahou, 2:14.13. 50 freestyle–1. Aniston Eyre, King Kekaulike, 23.69; 2. Rebecca Buenrostro-Gallimore, Baldwin, 24.21; 3. Alexa Phillips, Punahou, 24.41; 4. Karly Noetzel, Hawaii Prep, 24.47; 5. 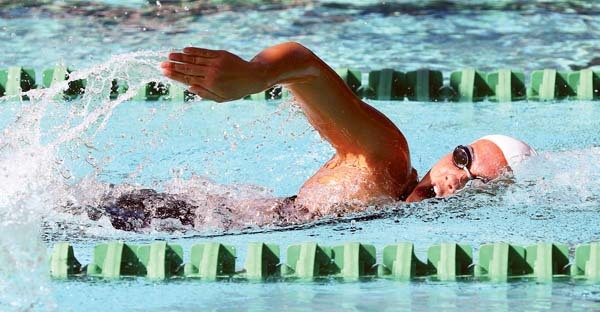 Kimberly Guevara, Maryknoll, 24.57; 6. Kate Fujii, Kalani, 24.64; 7. Rose Garcia, La Pietra, 24.68; 8. Chanel Ng, Punahou, 24.98. 100 butterfly–1. Lexi Anderson, Lahainaluna, 54.85; 2. Kysha Altura, Maui Prep, 58.23; 3. Tori Gacutan, Punahou, 58.49; 4. Shirley Li, Kalani, 58.51; 5. Kaya Takashige, Leilehua, 59.36; 6. Mikaila Domingo, Kapolei, 59.57; 7. Paulina Ruelas, Kalani, 1:00.10; 8. Kyrie Sasaki, Punahou, 1:00.38. 100 freestyle–1. Sydnee Whitty, Punahou, 51.18; 2. Aniston Eyre, King Kekaulike, 52.16; 3. Kira Parker, Hawaii Prep, 52.44; 4. Nohea Lileikis, Punahou, 52.67; 5. Sofia Carlson, Kaiser, 53.25; 6. Jordynn Brown, Maui High, 53.50; 7. Kate Fujii, Kalani, 53.66; 8. Ku’uleionalani Patterson, Kealakehe, 53.91. 500 freestyle–1. Jasmine O’Brien, Seabury Hall, 4:59.70; 2. Shaye Story, Kamehameha Kapalama, 5:03.59; 3. Mina Poppas, Waiakea, 5:09.41; 4. Reyna Iwamoto, Moanalua, 5:14.25; 5. Mallory Meister, Punahou, 5:16.72; 6. Olivia Stoetzer, St. Andrew’s, 5:17.76; 7. Caroline Short, Maui High, 5:22.25; 8. Josie Mobley, Punahou, 5:22.71. 200 freestyle relay–1. Punahou (Sydnee Whitty, Chanel Ng, Alexa Phillips, Tori Gacutan) 1:36.61, 2. Baldwin 1:39.09, 3. Kaiser 1:40.47, 4. Kamehameha Kapalama 1:41.58, 5. Le Jardin 1:42.77, 6. Maui Prep 1:44.91, 7. Iolani 1:45.76, 8. Maui High 1:48.75. 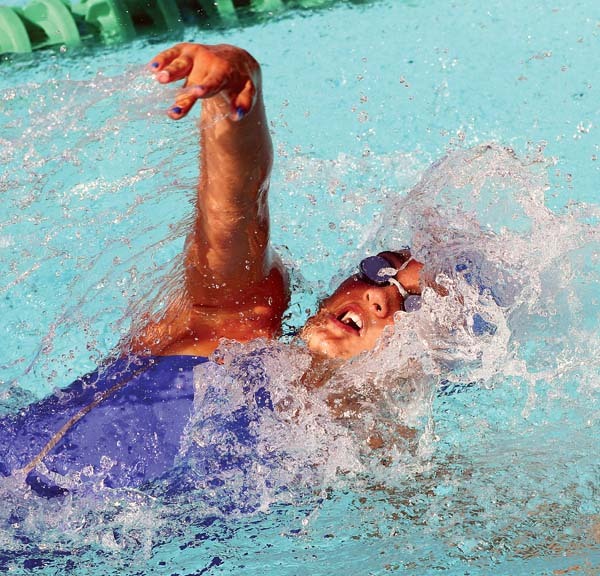 100 backstroke–1. Rebecca Buenrostro-Gallimore, Baldwin, 57.17; 2. Alana Barthel, Le Jardin, 57.58; 3. Kira Parker, Hawaii Prep, 57.66; 4. Jordynn Brown, Maui High, 58.77; 5. Lexi Anderson, Lahainaluna, 59.30; 6. Erin Patterson, Kaiser, 59.91; 7. Echo Baraquio, Maryknoll, 1:00.61; 8. Korrie Tengan, Waiakea, 1:01.77. 100 breaststroke–1. Maile Lawson, Hawaii Prep, 1:02.51; 2. Kaimilani Matsumoto, Baldwin, 1:05.29; 3. Jamy Lum, Kamehameha Kapalama, 1:05.34; 4. Mari Yasumi, Kaiser, 1:06.62; 5. Kaya Takashige, Leilehua, 1:07.29; 6. Paloma Banto, Maui Prep, 1:07.74; 7. Ku’uleionalani Patterson, Kealakehe, 1:07.84; 8. Abbey Mitchell, Le Jardin, 1:09.93. 400 freestyle relay–1. Punahou (Alexa Phillips, Sydnee Whitty, Chanel Ng, Nohea Lileikis) 3:29.35, 2. Kalani 3:37.43, 3. Kamehameha Kapalama 3:39.87, 4. Hawaii Prep 3:44.22, 5. Seabury Hall 3:45.77, 6. Waiakea 3:47.35, 7. Le Jardin 3:47.97, 8. Maui High 3:48.03. Team standings–1. Punahou 67, 2. Mid-Pacific 37, 3. Kamehameha Kapalama 35, 4. Iolani 27, 5. Kalani 15, 6. Kaiser 12, 6. Roosevelt 12, 6. Kauai 12, 9. Le Jardin 8, 10. Leilehua 5, 11. Saint Louis 4, 12. University 2, 12. Campbell 2, 14. Hilo 1, 14. Hawaii Prep 1. 1-meter diving–1. Dyson Lee, Iolani, 313.95; 2. Aaron Kwok, Iolani, 311.05; 3. Culley Jones, Iolani, 301.00; 4. Calvin Carpenter, Mid-Pacific, 298.90; 5. Kore Ohumukini, Hilo, 280.00; 6. Luke Bradley, Punahou, 272.10; 7. Matt Ching, Hawaii Prep, 269.75; 8. Noa Schachtel, Punahou, 266.45. 200-yard medley relay–1. Punahou (Sean Kwon, Jason Hiremath, Ray Sakamoto, Jake Gaughan) 1:34.67, 2. Kamehameha Kapalama 1:35.32, 3. Iolani 1:39.52, 4. Le Jardin 1:42.01, 5. Kalani 1:43.38, 6. Hawaii Prep 1:43.44, 7. Roosevelt 1:43.50, 8. Baldwin 1:44.56. 200 freestyle–1. Allen Hayakawa, Mid-Pacific, 1:43.08; 2. Denison Piosalan, Saint Louis, 1:44.48; 3. Hendrick Bose, Leilehua, 1:45.50; 4. Micah Ginoza, Kaiser, 1:46.96; 5. Aapo Eerola, Hawaii Prep, 1:47.08; 6. Makena Ginoza, University, 1:47.72; 7. Ethan Bosworth, Punahou, 1:48.08; 8. Brock Imonen, Hawaii Prep, 1:49.54. 200 IM–1. Michael Petrides, Mid-Pacific, 1:48.73; 2. Tyler Kawakami, Punahou, 1:52.69; 3. DH Hwang, Kalani, 1:53.92; 4. Jaek Horner, Kamehameha Kapalama, 1:54.25; 5. Jack Machorek, Kauai, 1:55.55; 6. Nicholas Nakaya, University, 1:57.03; 7. CJ Berg, Moanalua, 1:59.44; 8. Jarrett Takahashi, Kaiser, 1:59.97. 50 freestyle–1. Joseph Ahia, Roosevelt, 21.11; 2. Noah Peters, Punahou, 21.35; 3. Josh Nekoba, Punahou, 21.56; 4. Noah Carlson, Kaiser, 21.58; 5. Colin Fergueson, Campbell, 22.40; 6. Ethan Bosworth, Punahou, 22.42; 7. Noa Copp, Kamehameha Kapalama, 22.53; 8. Kaden Parker, Hawaii Prep, 22.75. 100 butterfly–1. Joseph Ahia, Roosevelt, 50.26; 2. Kanoa Sawai, Kamehameha Kapalama, 50.69; 3. Zachary Safford, Kauai, 51.20; 4. Josh Nekoba, Punahou, 51.55; 5. Ray Sakamoto, Punahou, 51.71; 6. Weylin Foo, Kealakehe, 52.49; 7. Ronan Witherwax, Punahou, 53.16; 8. Corbin Lofton, Island Pacific, 53.31. 100 freestyle–1. Michael Petrides, Mid-Pacific, 44.36; 2. Tyler Kawakami, Punahou, 45.38; 3. Noah Carlson, Kaiser, 46.64; 4. Hendrick Bose, Leilehua, 47.56; 5. Jake Gaughan, Punahou, 47.78; 6. Schuyler Cole, Punahou, 48.54; 7. Jaesun Lee, Punahou, 49.17; 8. Rayne Duhaylonsod, Kalani, 49.28. 500 freestyle–1. DH Hwang, Kalani, 4:32.17; 2. Jack Machorek, Kauai, 4:39.89; 3. Micah Ginoza, Kaiser, 4:40.28; 4. James Lyon, Punahou, 4:44.37; 5. Makena Ginoza, University, 4:48.91; 6. Brock Imonen, Hawaii Prep, 4:51.39; 7. Denison Piosalan, Saint Louis, 4:54.54; 8. Matthew Olson, Punahou, 4:54.95. 200 freestyle relay–1. Punahou (Noah Peters, Jake Gaughan, Ethan Bosworth, Sean Kwon) 1:26.52, 2. Mid-Pacific 1:28.37, 3. Iolani 1:30.21, 4. Kamehameha Kapalama 1:31.39, 5. Kauai 1:31.60, 6. Hawaii Prep 1:31.76, 7. Roosevelt 1:32.75, 8. Kaiser 1:32.26. 100 backstroke–1. Noah Peters, Punahou, 51.60; 2. Sean Kwon, Punahou, 52.77; 3. 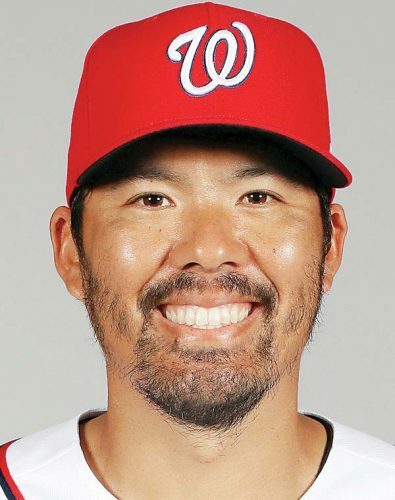 Allen Hayakawa, Mid-Pacific, 53.59; 4. Amos Jun, Iolani, 53.69; 5. Jonel Escobar, Campbell, 53.88; 6. Jaesun Lee, Punahou, 54.35; 7. Devin Alejado, Kamehameha Kapalama, 54.64; 8. Kainoa Yee, Hanalani, 54.74. 100 breaststroke–1. Jaek Horner, Kamehameha Kapalama, 56.48; 2. Luke Faurot, Le Jardin, 57.91; 3. Kanoa Sawai, Kamehameha Kapalama, 58.10; 4. Zachary Safford, Kauai, 58.88; 5. Nicholas Nakaya, University, 59.62; 6. CJ J Berg, Moanalua, 59.76; 7. Jason Hiremath, Punahou, 1:00.00; 8. Austin DeCambra, King Kekaulike, 1:00.30. 400 freestyle relay–1. Punahou (Tyler Kawakami, Noah Peters, Josh Nekoba, Jake Gaughan) 3:06.01, 2. Kamehameha Kapalama 3:15.37, 3. Mid-Pacific 3:16.03, 4. Kalani 3:18.91, 5. Kaiser 3:19.13, 6. Iolani 3:19.42, 7. Hawaii Prep 3:22.88, 8. Radford 3:26.42.